Efforts to crack WEP encryption have been around and even publicly discussed since the inception of the WEP protocol, and this page brings you information about how to discover and calculate a WEP key from network traffic. This introduction to WEP cracking may be useful to anyone who intends to investigate network security. Cracking WEP itself is relatively easy and can take anywhere from as little as a few minutes to a few hours (depends on the amount of network traffic, connection quality, etc.). Setting up your equipment so that it does what it needs to do can take weeks (depends on what you have and what you already know). Before you proceed to WEP cracking, read our first page of this "tutorial" which can provide an idea about setting your computer and also about the legality of WEP cracking. Now we can proceed to demonstrating how to crack WEP encryption. What do I need to discover a wireless network WEP key? Here is a list of assumptions that you need to meet in order to be able to discover a WEP key from network traffic. Note, the assumptions listed below are specific to this tutorial. Other tutorials on the web are based on different assumptions. You are physically close enough to the access point to send and receive packets. Remember that just because you can receive packets from the wireless access point does not mean you will be able to transmit packets to the access point. The wireless card strength is typically less than the access point strength, so you have to be physically close enough for your transmitted packets to reach and be received by the access point. There is at least one wireless client connected to the network and active. The reason is that WEP cracking relies on ARP packets and if there are no active clients then there will never be any ARP request packets. Ensure that all of the above assumptions are true, otherwise the examples that follow will not work. We have tested WEP cracking with two network adapters: Intel PRO/Wireless 3945ABG with the ipwraw-ng-2.3.4 driver and alternatively TP-LINK TL-WN321G network adapter dongle with the rt73-k2wrlz-3.0.1. driver. The Intel adapter is referenced as wlan0 (wifi0), and the TP-LINK adapter is referenced as rausb0. You can find the name of your network adapter by executing the iwconfig command. Does my network adapter driver work correctly? Wlan0 (and also wifi0) is the name of your Intel 3945 network adapter. It would be rausb0 if you worked with the TP-LINK 321. 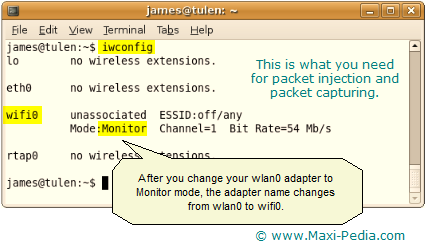 You can find the name of your network adapter by executing the iwconfig command. The print screen below shows you what you want to see in your iwconfig screen. If the network interface is set correctly, it should say Monitor mode. They both should result in the "Injection is working!" message. You can find more details here: http://aircrack-ng.org/doku.php?id=injection_test. Ok, we have all the hardware and software ready, now it is time to explain how WEP cracking works. Sounds easy? Let's get into the details. If you want to listen to network traffic and to capture network traffic, your network adapter needs to be in Monitor mode. We already covered this above and also on the How to crack WEP with Intel PRO/Wireless 3945ABG page. You can see names of available wireless networks in the most right column and MAC addresses of access points in the most left column. This screen also tells you how each network is secured (WEP, WPA, OPN, etc). You can also find out on which channel each access point operates. Note, you will need to disable your network adapter before changing your MAC address and then enable it again, so it is an exercise that goes through the two pages referenced above as well as through point 1 and 2 again. where -c is the channel on which your target access point is broadcasting, BSSID is the MAC address of the access point, and -w wepdump -i (we will explain later). The screen will look similar to the screen above. This is the same command as in step 3. We used it in step 3 to find someone that is already using your wireless access point; now we use it to capture initialization vectors. The option -w wepdump is the name of file where you want to save your initialization vectors. Option -i means that you want to save initialization vectors only and discard all other data. The screen will look similar to the screen above in step 3.
where -1 means fake authentication, 0 means reassociation timing in seconds, -e datel is the name of the network, -a is the access point MAC address, and -h is the MAC address under which you act (either your own or the spoofed one if you went through step 3). This is what the output should look like. Remember, the MAC address you target for injection must be associated with the access point by either using fake authentication or using a MAC address from an already-associated client (step 3), or both at best. Possible problem: If you get "Got a deauthentication packet" and then continuous retries, then you are probably dealing with MAC filtering (that is some access points are configured to only allow selected MAC addresses to associate and connect). Go back to step 3. If this is the case, you will not be able to successfully do fake authentication unless you know one of the MAC addresses on the allowed list. Possible problem: If you get "Waiting for beacon frame (BSSID: ...) No such BSSID available." then you are dealing with weak wifi signal. Get closer to the access point. Sending Authentication Request [ACK] that just keeps repeating on the aireplay-ng screen is another common problem. If you keep getting "Sending Authentication Request" or "Sending Association Request" that keep coming back, then you are too far away from the access point or are dealing with weak signal. Remember, the fact that you can capture packets from the access point does not mean that the access point can also capture packets from your computer. The signal going out of your computer is much weaker. Also, check that you are communicating on the same wireless channel as the access point. Some times, the fake authentication just does not work no matter what you do and you have to proceed without it. If the previous step fails in your case, and you are unable to do authentication with either a fake or your own MAC address, the next step 6 - packet injection - will likely fail too. Try it out and see. If step 6 fails, return to this section. No worry, you can still crack WEP; it will just take more time. If you are unable to authenticate and as a result do packet injection, you will be watching the screen which you opened in step 4 for a while. Your goal is to see at least 150,000 in the #Data column. If you look at the RXQ column in the print screen above, you can see there number 49. This value provides information about the quality of your wireless connection between the access point and your computer. Anything below 80 is considered weak. If the number fluctuates a lot, you have weak signal as well. The RXQ value relates to the data stream going from the access point to your computer. Even if this number is above 80, the access point still may not be able to see your computer. This is the most common reason for fake authentication and packet injection to fail. If that is your case, just sit back and wait until the #Data column shows at least 150,000, and then try step 7 (WEP crack). Without authentication and packet injection, this process might take 1,5 - 2 hours. You can start trying WEP crack in step 7 as soon as the #Data reaches at least 80,000, but our experience is that WEP keys usually get cracked once having somewhere around 150,000 initiation vectors. where -b is the access point MAC address, and -h is the MAC address under which you act (either your own or the spoofed one if you went through step 3). This command will start listening for ARP requests and when it hears one, aireplay-ng will immediately start injecting it. You can generate an ARP request by pinging some other client that is already associated. You can confirm that you are injecting by checking your airodump-ng and aireplay-ng screens. The data packets should be increasing rapidly. The ”#/s” should be somewhere in the range of 300 to 400 data packets per second. It can as low as a 100/second and as high as a 500/second. The ARP packets and Sent packets should be increasing rapidly as well. Possible problem: Note, if the ARP packets count and the Sent count as well are stuck at zero, then your network interface is likely not associated with your access point. Or, you can also be too far away from the access point (weak signal). Possible problem: Message similar to "Got a deauth/disassoc packet. Is the source mac associated?" means you have lost association with the access point. Go back to your other window from step 5 and rerun fake authentication. This is not necessary if you went through step 3 though. Once you have captured a large number of initialization vectors, you can use them to determine the WEP key. There are two basic methods for cracking WEP: the PTW method and the FMS/Korek method. Now that you know how to break into a WEP-protected network and therefore have discovered the weak link in your wifi network, we would also like to draw your attention to our security tutorials. We have written a few tutorials related to wireless network security. You can read more about IPSec, VPN, MAC addressing, WPA, WPA2, PSK, and many other wireless security measures. Our wireless security tutorials help you to make your network more secure.